How to Easily Master Format MICROSOFT LUMIA 950 (XL) with Safety Hard Reset? Tips and tricks to fix MICROSOFT LUMIA 950 / LUMIA 950 XL when this phone get trouble. This is Lumia high end smartphone with dual simcard options. So at market we can buy MICROSOFT LUMIA 950 single simcard or dual simcard and MICROSOFT LUMIA 950 XL single simcard or dual simcard GSM & GSM standby together. What is the different between MICROSOFT LUMIA 950 vs LUMIA 950 XL ? The main differences are at LCD screen size. LUMIA 950 use 5.2 inches with Gorilla Glass version 3 protections while LUMIA 950 XL use 5.7 inches LCD screen with Gorilla Glass version 4 protections. The processor also get different, LUMIA 950 use Qualcomm MSM8992 Snapdragon 808 with hexa core processor while LUMIA 950 XL use Qualcomm MSM8994 Snapdragon 810. The other specifications mostly not different. How to Fix or Problem Solving for Recovery MICROSOFT LUMIA 950 / LUMIA 950 XL hang or not responding or malfunctions or stuck or freezing or bricked ? Microsoft start to use Microsoft Windows 10 at their high end LUMIA 950 & LUMIA 950 XL. This phone have several interesting applications like Skype, Microsoft Office and several other more. Although the applications at Microsoft apps library is not as many as applications at Android or iPhone, but we still can get several interesting applications like Blackberry Messenger (BBM), Facebook, Whatsapp and other productivity applications. But sometime some applications not always compatible with our MICROSOFT LUMIA 950 / LUMIA 950 XL and can make this phone hang or stuck or bricks or boot logo loop or LCD touch screen not responsive. We have to force soft reset or force reboot or shutdown to restart all running applications and also remove temporary files and caches. If this problems still happen, then we have to do hard reset or master format. Please note, doing hard reset or master format can make all important data at MICROSOFT LUMIA 950 / LUMIA 950 XL become removed or wiped, therefore we should do backup all important things first before doing hard reset. How to Force Shutdown or Force Soft Reset or Force Reboot or Force Restart MICROSOFT LUMIA 950 / LUMIA 950 XL ? When our MICROSOFT LUMIA 950 / LUMIA 950 XL get hang or stuck because of applications or viruses or malware, then we have to try doing force reboot or force shutdown by open back cover case of MICROSOFT LUMIA 950 / LUMIA 950 XL, remove the battery from its positions, wait about 5 seconds then put again that batter at right place, then continue press POWER button to turn ON this phone. Do not worry to do soft reset or reboot, because this process will not remove any important files. We can do this shutdown process when our phone still not get trouble for clean up the temporary files or cache or to refresh the running applications. Please Press and hold POWER BUTTON for several second until the phone shutdown by itself, if you see ‘slide down to power off‘, do slide the icon at this phone then MICROSOFT LUMIA 950 / LUMIA 950 XL will turn off. We need to press Power button again to turn on this phone. How to Master Reset MICROSOFT LUMIA 950 / LUMIA 950 XL to Factory Default ? The MICROSOFT LUMIA 950 / LUMIA 950 XL will do the hard reset format, wait about three until five minutes. While waiting you will see the gear appear until it finish. With 32 GB internal memory with 3 GB RAM, we can install many interesting applications, but sometime bad apps can make MICROSOFT LUMIA 950 / LUMIA 950 XL operating system become damage or corrupt, then this phone functions is not running normally. At this time we have to reformat or reinstall with factory default Microsoft Windows 10 operating system. Before do this process, we have to know that clean factory default Microsoft Windows 10 OS firmware already saved safely inside MICROSOFT LUMIA 950 / LUMIA 950 XL ROM or internal memory, therefore we do not need to copy or connect from other device. Just follow simple steps to hard reset above, then clean factory default operating system or firmware will be reformat automatically. How to Unlock or Fix or Bypass or Solutions for MICROSOFT LUMIA 950 / LUMIA 950 XL forgot password code or security lock screen or pin (lost password)? The fantastic camera can make beautiful photography result, because this phone have 20 megapixel camera with Carl Zeiss Lens Optic, therefore we better give security protections to make our important photo or files become secure when this phone away from us or when MICROSOFT LUMIA 950 / LUMIA 950 XL stolen or lost. We can give screen protection at this phone using setting menu, but the problems happen when we forgot security protections answer, what should we do? Maybe because Microsoft try to give good security protections, then we can not unlock or bypass forgotten security password pin protections at MICROSOFT LUMIA 950 / LUMIA 950 XL. The only way to bypass is doing hard reset using hardware button combination key at steps #Options 2 above. How to Improve Performance MICROSOFT LUMIA 950 / LUMIA 950 XL to make run more faster? MICROSOFT LUMIA 950 / LUMIA 950 XL have new features to make this phone become simple PC and connect to keyboard, mouse and monitor, this features call by Continuum. Continuum only work at high-end Microsoft Windows 10 operating system smartphone and it is already installed at MICROSOFT LUMIA 950 / LUMIA 950 XL. But the problems using Continuum at this phone is not work smoothly and sometime lag or not responsive. This is not because MICROSOFT LUMIA 950 / LUMIA 950 XL hardware performance because this phone already have good benchmark review result. Maybe this problems comes from Continuum it self which need more improvement because it is still first release at this phone. Other slowly problems happen because of too many applications run at system, than make this phone run more slowly as well. For this problems, we need to uninstall some not use applications. Doing hard reset or reformat to factory default also can make this phone run faster again like new. 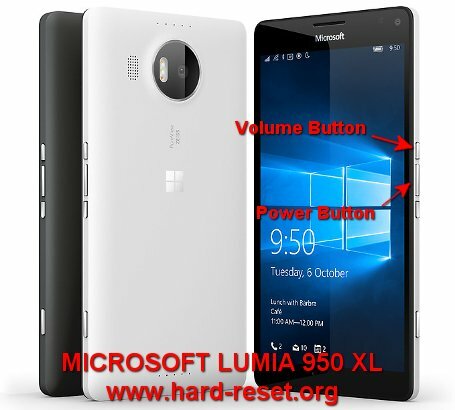 What is the Secret Code Key for Hard Reset MICROSOFT LUMIA 950 / LUMIA 950 XL ? There is no secret code for doing hard reset or master format MICROSOFT LUMIA 950 / LUMIA 950 XL. Just follow the step above to hard reset is the easy way to do. The information from this page describe about lumia 950 xl hard reset,restore bricked 950 xl,reset lumia 950xl,nokia lumia 950 factory reset,lumia 950 xl software reset,lumia 950 xl press any key to shutdown,fix bricked 950xl,lumia 950 stuck at microsoft logo,howto recover lumia 950 xl with wpinternal,How to reformat Microsoft Lumia 950. If you need another resource for hard reset, use search function at this homepage or find from our related posts. How to Easily Master Format MICROSOFT LUMIA 640 LTE (DUAL) with Safety Hard Reset? How to Easily Master Format SAMSUNG GALAXY ON8 with Safety Hard Reset? How to Easily Master Format LENOVO IDEATAB A3000 with Safety Hard Reset?